“[Ricki Carroll] has inspired artisans from Lorie to Las Vagas. She’s the Billy Graham of Cheese.” – Barbara Kingsolver, from Animal, Vegetable, Miracle. 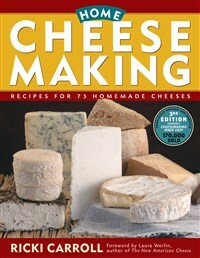 “A must-read for anyone interested in cheese making!…offering abled cheese makers knowledge to excel at their craft and novices a world of information…” – Jodi Wische, Old Chatham Sheepherding Co.